Discover Guanacaste’s Most Beautiful Locations while Riding an ATV! Tamarindo is in the region of Guanacaste famous for its tropical dry forest setting and year-round sun. 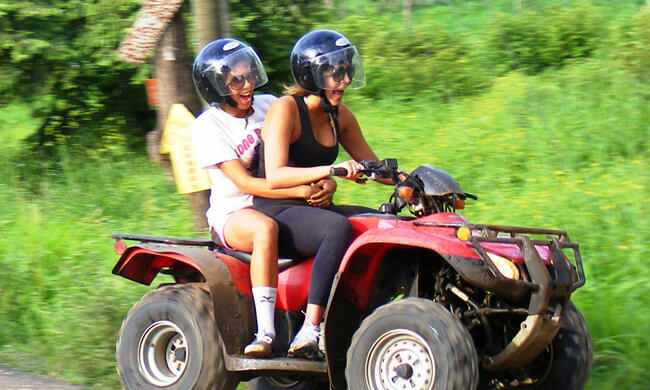 This ATV tour gives you the opportunity to explore the area in an adventurous way by driving along unpaved roads through the mountains and down to the beach. A great tour for anyone looking for some off-the-beaten-track adventure and interested in discovering the natural beauty of the area. Your tour begins when you are picked up from your hotel and driven 15 minutes to the start of your adventure. Upon arrival you can choose between the mountain or beach trail options. Your local bilingual guide will go through the necessary safety instructions and fit you with your helmet. You will then have a chance to practice on your fully equipped Honda ATV before heading off along scenic trails into the mountains. On the mountain trail, you will head up into the hills where you can take in the natural beauty of the native flora and fauna of the Guanacaste region. Spot Guanacaste Trees and rare Pochote trees while enjoying the panoramic views of the Pacific Ocean. With luck you may spot animals like monkeys, armadillos, pizotes, and birds. On the beach trail, you will head down to the coast passing some of the most beautiful beaches in Costa Rica. You will take a break on a quiet beach with crystal-clear water where you can cool off with a swim in the Pacific Ocean. Age limitations: 6+. Children under 16 not allowed to drive an ATV. They are allowed only as an extra passenger. Tour includes: Transportation, fully equipped ATV, safety helmet, bilingual guide. What to bring: Comfortable clothing, swimming suit, towel, insect repellent, sneakers/water shoes, camera.